Mobile VoIP provider Rebtel has hit some key milestones on Friday, indicating that the VoIP market is quickly gaining momentum. Rebtel, which offers low-cost and free calls over 3G and Wi-Fi, has cracked the 15 million user mark and claims its average revenue per user is three times greater than that of Skype(s msft). Rebtel made a smart decision early on to bring its communication service to multiple mobile and desktop platforms. The company has apps for iOS (s aapl), Android (s goog), BlackBerry (s rimm) and Microsoft Windows. Similar to Skype, calls can be placed to other Rebtel users for free, while calls or messages to landlines and mobiles around the world are priced as low as $0.01. Building up an audience of 15 million users with such products shows that consumers are looking for less-expensive ways to stay in touch with one another by leveraging the Internet as a conduit. Obviously, calling a mobile or landline with Rebtel isn’t a full VoIP solution, as the call is routed on a carrier voice network or an old telephone line. But support for Wi-Fi and 3G calling lessens the need to use traditional cellular voice minutes. Sadly, there are few ways to have a data-only service plan on a phone in the U.S. I am doing just that with VoIP and SIP support on my Galaxy Nexus with a data-only SIM, but I am certainly in the minority. Most people will still pay for a voice service these days, but with services such as Rebtel, folks can cut back to the lowest voice plan with their carrier, using Rebtel as a cheaper substitute. 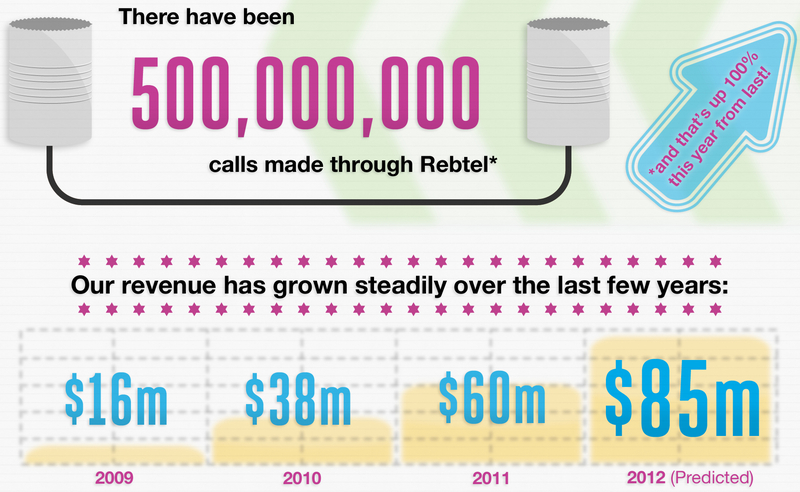 That is apparently happening, as Rebtel has now delivered 500 million connected calls and 2 billion minutes of international calls while boosting revenues in 2011 by 55 percent. For quick point of reference: Rebtel is 1.79 cents to India; Nymgo is 1.1 cents.